Every week, I do something I really dislike. Dislike it so much, in fact, that I’d rather not do it. Yet there I am, week after week, repeating the process. So why not stop, you ask? Because, really, grocery shopping is somewhat essential to getting the family through the week. But that doesn’t mean I have to enjoy the crowds, the cost, the challenges of keeping the children in control, and dealing with an unwieldy paper list of items to be purchased, created in a basically random order. I can’t do anything about most of my grocery shopping dislikes—a man’s got to eat, after all. 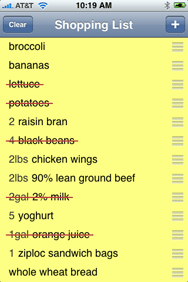 But a new class of iPhone programs has emerged to at least tackle the paper list problem: grocery list apps. At its core, a grocery list app is simply a customized To Do application, with features targeted specifically at managing lists of groceries. 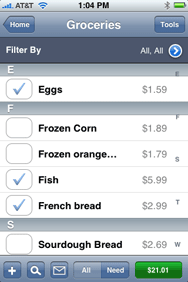 As such, any standard To Do application could support grocery lists as well as a standalone app. To keep the size of this comparative review somewhat manageable, however, I chose to focus solely on those programs that were specifically targeted to grocery shopping. Searching on grocery in the App Store returns around 40 matches, so this is a popular concept. Of the 40 apps that showed up in my search, I narrowed the list down to 22 apps that were truly grocery list apps, and that seemed to offer a useful feature set and usable interface (based on the screenshots and descriptions in the App Store and on the developer’s pages). I then installed all 22 apps on the iPhone, and set about trying to identify the best of the best. At the end of many long simulated (and real) shopping trips, I had narrowed down the list to the three programs that I feel did the best job of replacing my paper-based grocery list. However, how you evaluate these programs may be different than mine, so I’ve decided to include the table I used to evaluate the features in all 22 of the programs, so you can see how each did in specific areas, as well as some brief notes about each application. In this way, you can compare the three programs I’ve chosen with the rest of the population and see if a different program may meet your needs. The three programs I ultimately selected vary widely in price, feature set, and interface. But all three are more than capable of meeting your weekly grocery list needs. Many of the other programs are also very good, so review the above-linked table to get a sense for their feature sets, and read comments from purchasers on the App Store, to see if one might work better for you than the programs I selected. SplashShopper List Manager ($8) is actually somewhat more than just a grocery list app, as it handles shopping for everything from wine to movies, to creating emergency contact lists and travel checklists. However, it’s the only grocery list app I reviewed that offers easy and seamless list syncing with a desktop computer (Mac or PC) —though this requires a separate $20 purchase of SplashShopper for the desktop. Although this isn’t a review of the desktop application, I did test creating and syncing lists between my iPhone and Mac Pro, and it worked perfectly. As a standalone grocery list application, SplashShopper is feature rich, though it has a couple of usability issues. The main screen shows all the various lists—and SplashShopper ships with a dozen or so pre-populated lists, including one Groceries list. Tap the Groceries entry, and you’ll be looking at the one screen that SplashShopper uses to show you both everything in the database, and those items you need to buy. You toggle between these two modes by tapping the All or Need buttons, respectively. There’s also a plus button (for adding items to the database), a magnifying glass (for searching), an e-mail button (to send the list), and a dollar figure that shows the total cost of everything on your Need list. If you tap on an entry in the All/Need list, you’ll bring up the edit screen for that product’s details. Here you can add quantity and price information, assign the product to a store (you can use SplashShopper to put certain items only in certain stores), enter a description, and note whether or not it’s a taxable item. To add an item to your shopping list, you tap a box next to its name in the All view; you remove it the same way—you can’t remove products directly from the Need list, so you have to toggle back to All, find the product you want to remove, and then tap its box again. In both All and Need views, you can filter the matches by store and/or category; the default view shows all matches for both stores and categories. The Need view has a number of viewing options, including a landscape mode that shows item, category, and price columns (you get only two columns in portrait mode). You can specify which column, in addition to item name, shows up in portrait mode—by default, it’s price. The problem with the default view is that you won’t see quantities for the items on your list unless you tap them to see the record detail. For that reason, I chose to set quantity as the second column, so that I could see how many of each item I needed to buy. When you tap an item’s check box in Need view, it vanishes from the list—at least, that’s what happens if you don’t modify the settings. Tap Tools and then select List Preferences to tell SplashShopper to keep purchased items in Need view, and to have them automatically move to the bottom of the list when tapped—I find the program more logical to use when it’s set up in this manner. In the Tools screen, you can also change the default sort column and order—the default is alphabetical, but that doesn’t help when you get to the store—SplashShopper’s lists can’t be reordered via dragging. This is one of the biggest shortcomings of SplashShopper, as there’s no easy workaround—you’d have to use categories to group items that are in similar locations in your store, and even then, that would only work for one store. The other programs that allow drag-to-reorder are more flexible in this regard. Overall, I found SplashShopper to be a well-thought-out, comprehensive program—especially for its ability to handle many different categories of shopping. The various usability issues in the grocery list portion of the app, however, leave it behind the other two programs in this round-up in terms of usability. If you need desktop synchronization, however, it’s the only game in town. 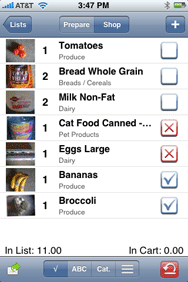 Of the two free grocery list applications I tested, ShopShop was my favorite. It’s not feature rich by any measure, but it’s very simple to use and works quite well for handling basic grocery list needs. When launched, ShopShop greets you with a blank yellow screen, adorned with only two buttons—Menu, and a plus sign. Tap the Menu button to delete the existing list (ShopShop supports only one list) or to e-mail the list to someone. (The ability to e-mail, or otherwise share, a list to someone else is useful in households where more than one person may do the shopping.) Tap the plus sign, and the data entry screen appears. There’s not a lot of complexity here—just a box to enter a quantity (and abbreviation, i.e. 2gal or 4lbs), a Recent Items section showing items that were recently on the list, and the keyboard. The Recent Items section works quite well; you first see anything you’ve recently shopped for that’s not on the list. Tap an entry, and it’s added to your list (or swipe the entry to permanently remove it). Given the list of recent items will be long, ShopShop also has on-the-fly matching; as you type, the list of recent items updates to reflect only those entries that match what you’ve typed. I found I could get to any item in my recent items list with only a couple of typed letters. This great time-saving feature is essential in ShopShop because you can’t save a list for easy future re-use, so you’ll have to set up the list from scratch each week. After building your list, you can rearrange the items on it by dragging the right side of each line—this lets you match the layout of your list to the layout of the grocery store to make sure you don’t miss anything in a given section. You can edit an entry’s name or quantity by tapping and holding on it, and you mark it off the list while shopping with a simple tap—a red line will be drawn through the item, indicating it’s been added to your cart. (A second tap will remove the red line.) If your list has marked-off items on it, the Menu button changes to read Clear; press that, and all the red-lined items will be erased from the list, making it easy to see what’s left to buy. If you’ve built a list, and haven’t purchased everything on it, you’ll see a red “Mail-like” item count badge on the ShopShop icon on the iPhone. ShopShop is light on “power shopper” features—there’s no ability to input or track prices, you can’t save lists for easier reuse, and there’s no pre-populated list of groceries to pick from. But as a basic grocery list tool, I found it very fast on its feet, with enough features to get the job done for most shoppers. Grocery Gadget Shopping List ($3) is a full-featured grocery list app that also works well to manage other sorts of shopping—specialized lists for Thanksgiving, office supplies, Mac software to be purchased, or whatever else you may need to buy. Grocery Gadget stores these lists, so you can easily refresh them, or (in the case of grocery shopping) use them over and over. You could also set up lists by store, if you wished—the program doesn’t really care what your lists are for, it just tracks them for you. The main screen shows all saved lists, along with an Edit and plus-sign button. The Edit button lets you delete lists, and the plus sign will create a new list. Tapping an existing list brings the list, which can be viewed in two modes—Prepare (to add items to the list) or Shop (go shopping with the list). In Prepare List mode, a tap of a plus button brings you to the item addition screen, displaying a long list of grocery items, a search box, and buttons to sort the product list alphabetically or by category. To add a product, tap it in the list, or start typing its name in the search box. As you type, the list of products will change to reflect items that match what you typed. The size of the Grocery Gadget database is both a strength and a weakness here—the app has probably every grocery-related item you may think of buying (lemon poppy seed spice and pet bird toys included), but this means that you’ll get lots of matches for most searches (candy returned more than 100 matches). If this really seems troublesome, you can mass-delete products (optionally the entire database) by using the Edit button. I found that searches were generally fast enough that this wasn’t a huge problem. Items on your list can be rearranged via dragging, so that they’re in the same order as your store is laid out. Tapping an item on your list brings up the details screen, where you can add quantity, notes, price, taxes, category (you can add additional categories, if you want full control over how your items are sorted), and image. You can optionally choose to attach a photo from your library, or take a new one with the camera. You can then resize, zoom, and even rotate the image to make it look just right with the product. Once you’ve built the list, you’re ready to go shopping—over and over with the same list, if you wish. To delete an an item from a list while you’re shopping, you simply swipe it and a Delete button appears; tap that, and the product is completely removed from your list. However, if there’s something on your list that you don’t need to buy this week, but you want to keep on your list, just tap its box twice—the second tap turns the check box into a red “X,” indicating you’re not buying that item this time around. If you tap an item’s name, instead of its check box, you’ll see the same details screen as in the Prepare List area—so you can enter price information as you toss each item in your basket, for instance.